Is it really Spring ?? The sunshine is abundant this morning! It is also finally above 40 degrees. SPRING may finally be here. Last night we had another freeze warning, and people all over the area were covering their outside plants or bringing them back into the house. Hoping for mid 50’s today. My hubby gave me some new lilac’s to plant in the yard for my birthday and I am hoping it warms up enough to get out in the yard and do that today. Yesterday, on Easter, a dear friend gave me a Dinner Plate Dahlia to plant along with a beautiful orange Gerber daisy. 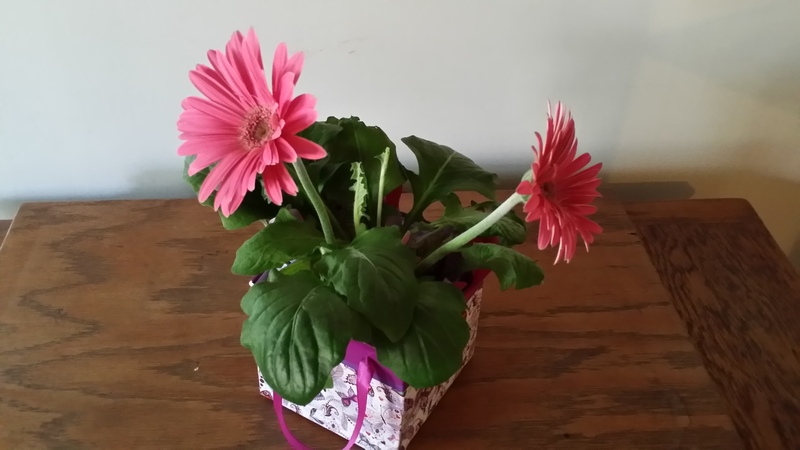 Our ‘last frost’ date is May 15th according to the Farmers Almanac, so I think the Gerber daisy will have to stay in the house for a bit. Seems one of my cats has tasted a leaf of the Gerber daisy during the night, and I need to find a place to “keep it in the light” but out of the reach of said cat. Maybe on top of the microwave…near a window….out of their usual prowling space. Do you have cats that like to prowl during the night into places that you never seem to find them during the day? I have these mysterious happenings during the night…pencils removed and relocated to under the kitchen table; paw prints on the stove, and such. When they were kittens we used to put them to “bed” in the laundry room, and close them in for the night. They were really climbers as “toddlers”. We have a shelf in the dining room that my husband keeps his “collectibles” on, and I have found them climbing up the wicker legs of the shelf. When one of his items crashed to the floor, we wrapped the wicker legs with foil to inhibit the climbers. I decided they need a climbing shelf of their own and bought one of those things from the pet store and parked it in the laundry room. definitely they needed a better place than my chair legs to do their scratching, and this had rope wrapped posts to do the same. (Until about 2 years ago we were PET FREE…..when we got adopted by a stray momma cat with 2 kittens….and then a 12-year-old Rottweiler in the final years of her life). One of our cats (Momma Cat) was not a good fit “in the house” as she was just too wild. We have given her a nice home, a heated cat igloo house, outside, and has now become the nicest, lovely cat ever. You walk out the door and the old girl runs to greet you and waits for you to stop and pet her. She used to be such a scared cat! And because we feed her outside, and she doesn’t eat all her food in one sitting, there is often food left in her bowl, and another stray has ventured into the yard and eats the leftovers. I chase him away, and he returns to clean Momma Cat’s bowl. I swear I am not befriending another cat! The first 3 cost me a fortune in vet bills to get them spayed, nutered, shots etc. So, how do you prevent the new stray from hanging around for a free meal? I have decided I am not up for chasing or trapping this one or the vet bills involved with keeping it, shots, nutering etc. It could be someones pet I suppose. So, for now, I will ignore it, chase it out of the yard, etc. I keep thinking do I put out less food for Momma Cat, so she is hungrier at feeding time or more food since she is subject to sharing? Well, time to go play in the sewing room this morning! Bunting beckons me~!~ Then I will be sorting through old costume jewelry for “decorations” for “crowns” for a 4-year-old birthday party! Time to get busy and go play in the sewing room!! Hope your Easter was a beautiful celebration of the blessing that we have in Jesus Christ and his plan of salvation for all who follow Him.